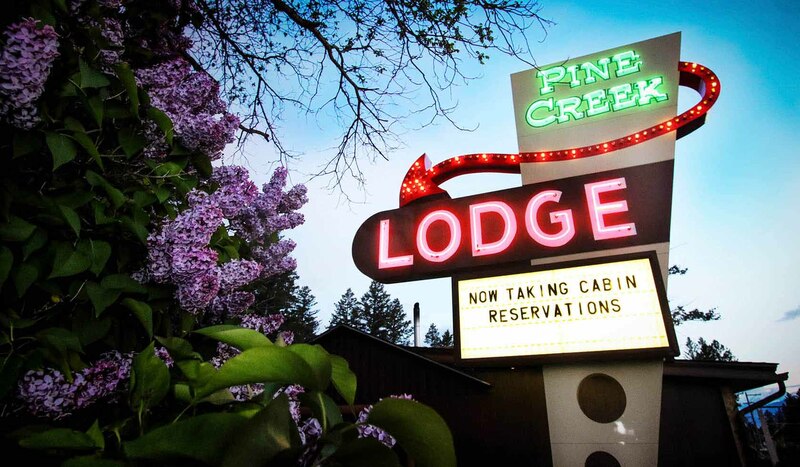 Pine Creek Lodge is a hotel, restaurant, bar, general store and live music venue, conveniently situated in the heart of Paradise Valley, just steps from some of the world's best hiking, fishing and hunting. Vibrant downtown Livingston is just ten minutes by car, and Yellowstone National Park is forty minutes to the south. The restaurant is open Wednesday through Sunday for lunch, dinner and Sunday brunch and features casual American fare made with locally sourced ingredients. From appetizers like tot-chos and baked mac n' cheese to unique burgers, tacos, special entrees, soups, salads and special items for kids, there's something for everyone on the menu. The bar offers a selection of local microbrews and domestics as well as a variety of wines. Built in 1946, the restaurant itself has a wonderful, intimate ambiance created by its wood-burning stove and original log cabin walls. The restaurant is festooned with decorative white lights and an eclectic array of furnishings and artwork, creating a fun and comfortable atmosphere that makes diners feel right at home. The centerpiece of the main room is a beautiful and environmentally friendly Hetta model Tulikivi soapstone woodstove from Finland. Pine Creek Lodge also features an outdoor deck and beer garden that are the optimal summer dining spaces. The deck is tucked into the trees, and it's not uncommon for diners to be treated to views of local wildlife from their tables, including whitetail and mule deer and the resident wild turkeys. Pine Creek Lodge is particularly well situated to allow our cabin and restaurant guests to observe the frequent summer rainbows and year round glorious sunsets. The restaurant is first come, first serve, but will take reservations for parties of 8 or more. Buses with up to 50 guests are welcome, but request 24 hours notice. If you have questions or would like to plan a trip, don't hesitate to call 406-222-3628.